In-home caregivers are not currently considered public employees under state law. They were, however, unionized as public employees in 2005 by the Michigan Employment Relations Commission through a process whose legality is under dispute. [*] A federal court has issued a preliminary injunction which permits the continuing collection of union dues and agency fees by the Service Employees International Union[†] pending the final outcome of the union’s federal lawsuit alleging that any failure to withhold dues would be an unconstitutional breach of the existing union contract. The 2005 unionization of in-home caregivers occurred in an unusual manner. The certification of a labor union as the exclusive collective bargaining representative for a group of employees occurs through different procedures depending on who the employer is. Certification is a necessary prerequisite to creating any union that an employer will be legally required to bargain with collectively. The federal National Labor Relations Board certifies larger private-sector unions, and it therefore certifies most private-sector unions. The NLRB does not, however, certify public employees of the states; only state governments do this. An interlocal agreement therefore requires the involvement of at least two local governments. These agreements are intended to “find solutions to metropolitan problems.”[¶] For instance, Dexter Township, the Village of Dexter, Scio Township and Webster Township have recently been negotiating an interlocal agreement to provide fire services for all four municipalities. In the creation of the MQC3, the interlocal agreement was reached between the Michigan Department of Community Health and the Tri-County Aging Consortium, an agency that had previously focused exclusively on the elderly in Clinton, Ingham and Eaton counties. The interlocal agreement was statewide in its scope. The MQC3 did not exercise control over the terms and conditions of employment for its ostensible employees. It did not hire or fire the caregivers, and it did not handle their payroll. With the creation of the MQC3 and its purported power under the interlocal agreement to collectively bargain as the public employer of the in-home caregivers, a union representing in-home caregivers had an entity to “bargain” with. In January 2005, the MQC3 and the SEIU presented a petition to MERC seeking certification of the union as the representative of the in-home caregivers. The petition stated that both the MQC3 and the SEIU consented to MERC’s “jurisdiction” over the matter. MERC then ran a mail vote among in-home caregivers to approve the SEIU as their representative union. The proposed bargaining unit was to comprise all 41,000 in-home caregivers in Michigan. The election received an approximate 19 percent response rate — 6,949 voted in favor of unionization, and 1,007 were opposed. The majority of caregivers, approximately 33,000, did not respond. On April 19, 2005, MERC certified the SEIU as the collective bargaining agent for in-home caregivers. Once the union representation was official, SEIU and the MCQ3 entered into a collective bargaining agreement that permitted the union to collect “union dues” and “agency fees”[**] from the checks sent by the DCH to in-home caregivers on behalf of the disabled adults in the Home Help Program. Starting in October 2006, the putative dues and fees were automatically deducted from the paychecks of all the in-home caregivers in the program. These dues and fees have since ranged from 2.5 percent to 2.75 percent of the caregivers’ checks. As of September 2012, the SEIU had collected more than $32 million in dues and agency fees. 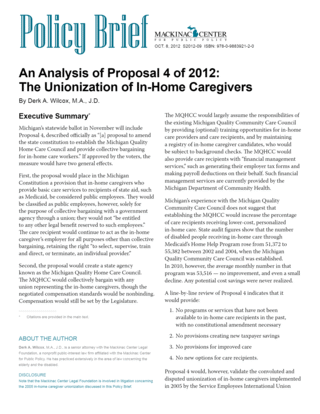 [*] The Mackinac Center Legal Foundation, a nonprofit public-interest law firm and an affiliate of the publisher of this Policy Brief, is currently involved in litigation challenging the unionization of in-home caregivers. For the MCLF brief in the case, see Patrick Wright, “Haynes and Glossop v SEIU and MQC3, Brief in Support of Charge of Unfair Labor Practice,”(Mackinac Center for Public Policy, 2012), http://goo.gl/z4fH7 (accessed Oct. 4, 2012). [†] For simplicity’s sake, the union representing the in-home caregivers will be called “the SEIU” in this Policy Brief. The petition for representation originally submitted to the Michigan Employment Relations Commission listed the Service Employees International Union (SEIU), AFL-CIO, as the petitioning union. “Petition for Representation Proceedings,” (Mackinac Center for Public Policy (Michigan Employment Relations Commission), 2005), 1, http://goo.gl/YCCkb (accessed Oct. 4, 2012). The first collective bargaining agreement was signed with the Service Employees International Union, Local 79. “Collective Bargaining Agreement Between Michigan Quality Community Care Council and Service Employees International Union, Local 79,” (Mackinac Center for Public Policy (Michigan Quality Community Care Council), 2006), http://goo.gl/dsD57 (accessed Oct. 4, 2012). The second collective bargaining agreement was signed with the SEIU Healthcare Michigan. “Collective Bargaining Agreement Between Michigan Quality Community Care Council and Service Employees International Union, Healthcare Michigan,” (Mackinac Center for Public Policy (Michigan Quality Community Care Council), 2009), http://goo.gl/YFq97 (accessed Oct. 4, 2012). The April 9, 2012, extension of the collective bargaining agreement was signed with the SEIU Healthcare Michigan. Executive Director Susan Steinke, Michigan Quality Community Care Council, email correspondence with Scott Heinzman, Board of Trustees, Michigan Quality Community Care Council, April 9, 2012. [‡] MCL 423.212. MERC, an agency of the executive branch of state government, makes decisions under the direction of three members, who are appointed by the sitting governor. The state statute establishing MERC requires that “not more than 2 members represent any one political party.” MCL 423.3. In 2005, at the time of the union certification, a majority of members were appointed by then-Gov. Jennifer Granholm. [§] Whether the in-home caregivers were public employees is analyzed at some length below. [¶] The “Address to the People regarding Article 7, Section 28 of the Constitution of 1963 states: “This is a new section designed to encourage the solution of metropolitan problems through existing units of government rather than creating a fourth layer of local government. Local governments are allowed to join in a variety of ways to work out together the solutions to their joint problems.” 2 Official Record, Constitutional Convention 1961, p. 3394. [**] As explained in the Mackinac Center Policy Brief “Proposal 2 of 2012: An Assessment,” “When a union is certified as a collective bargaining representative in the workplace, it gains a monopoly right to become the ‘exclusive representative’ of all of the employees during collective bargaining. Employees who support the union’s presence may choose to formally join the union, in which case, they would owe membership dues to the union. But in many states, including Michigan, a union also gains the legal power to demand payment from all employees for its negotiations during collective bargaining and ‘grievances’ (i.e., resolving disputes with management). This payment is generally known as an ‘agency fee’ and would be collected from all employees not already paying union dues.” Patrick J. Wright et al., “Proposal 2 of 2012: An Assessment,” (Mackinac Center for Public Policy, 2012), 9, http://goo.gl/Bihc2 (accessed Oct. 7, 2012).